The hotel has a gift shop. I am a guest in this friendly country and I have tried to write a nice sentence about it. I have tried to find an upside, I have even tried to find something to take home. Unfortunately all these things have proved impossible. Basically it is stuffed with bling and crystal. This is just one part of one shelf of one cabinet and there are lots more. OK, it's easy to poke fun at other people's taste, but usually you can find something that is not horrendous. The one saving grace is the collection of crystal mosques. They are not particularly attractive and do not look very much like the buildings they claim to represnt (unless I have been totally misled and they really do have see through walls). But they do give a good sense of layout - and in some cases, scale. Here are the crystal Mosques of the The Rock in Jerrusalem & The Mosque at Medina. I have heard of both these places. I feel slightly better informed having seen these models. I am unlikely to go to Mecca, but I have seen the Haj on TV and I have seen the procession around the Kabba, the large black cube in the centre of the courtyard. This has given me some idea of how big it is. The little black blip in the middle is the Kabba. The picture below (taken from Wikipedia) shows it during the Haj. That is one seriously BIG building. So while it may be a lousy gift shop, it has given me food for thought, and there was no charge. 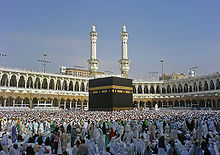 Incidentally, Wikipedia also includes the information that Kabba may be the root of the word 'Cube'. So another learning opportunity - bargain! Snippets of Wisdom - The Right Type of Snow?